Is Your Social Security Money Going Towards Your Retirement? On August 14, 1935, President Franklin D. Roosevelt signed the Social Security Act into law to protect the average citizen and their family against the loss of a job and poverty-ridden old age. While this program continues to help senior citizens and families today, this program is contributing heavily to our national debt and damaging our nation’s fiscal health. Although our national debt is reported as $18.6 trillion, the government excludes a vast majority of retirement liabilities, such as Social Security. The federal government’s most recent financials from 2014 excluded $27.9 trillion of Social Security benefits from the national debt. Many Americans believe the government has only $2.7 trillion of retirement debt because that is the amount the government reports. However, the government is able to exclude $27.9 trillion of debt from its reports because government officials believe no benefits are owed beyond the checks that are currently written. Unfortunately, that is not the only myth about Social Security. 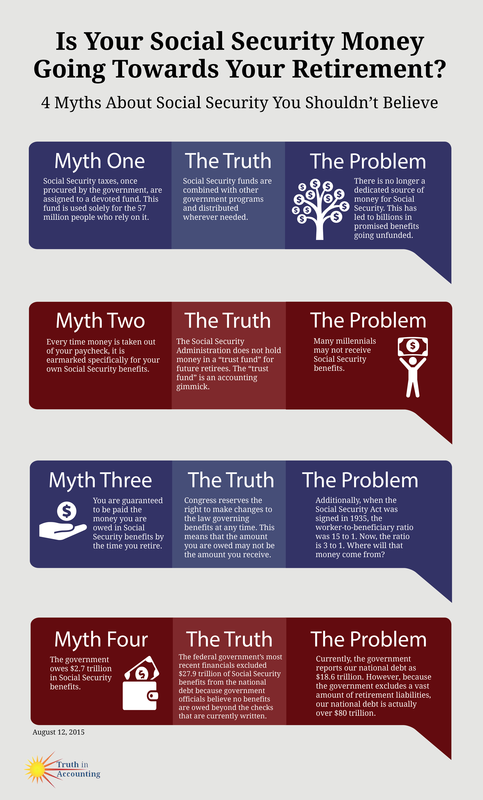 As part of our Federal Project, we have highlighted four myths about the social program below. It’s time for legislators to acknowledge the truth about Social Security and other retirement liabilities. Our nation’s future depends on it.